Questions you might have or want to ask before the swap starts, when you’re creating your own DIY Post Cards – and then when you’re waiting for and receiving postcards. Do you have a question that is not answered on this page, feel free to contact me! Can I pay with a credit card? If you don’t have a paypal account or don’t want to create one you can still join the swap. You can absolutely pay with your VISA or other credit card, but you will have to do it through Paypal because that is the system used for the swap. Click the paypal button, but instead of logging in to Paypal scroll down. There is a gray area, with the option that says “pay with debit or credit card” on that page. Then you will be prompted to write in your card numbers instead of logging in. Money will be drawn from your bank account instead of a Paypal account, but non of your bank information will be given to individuals or third party except PayPal. When you sign in, just fill in that you payed via credit card where we ask you for your transaction ID, and skip the field for paypal e-mail. Can I sign up my kids / grandchildren for the swap? No you can not, sorry. This is a postcard swap for adults. I don’t think it is fair game to the kid creating, nor the few people that receive kid’s art but don’t appreciate that kind of thing. But please, let your kid make postcards along with you, and send those out to friends and relatives instead. They can be part of your process, and wait together with you to receive your postcards. Encourage them to make postcards with their friends, and swap in preschool/class. Thanks for understanding! Let’s say, if you’re 16 or older (and you have your parents approval to join) you can, but I recommend you make the 10 cards before you sign up so you don’t forget/run out of time. Let me know if you need any help along the way. I don’t have paypal. Can I pay you in cash? Sorry, I can not except cash or checks at this time. But thanks for asking! When you click the pay-button you will be directed to a paypal page, but you do not have to have paypal to use it. If you don’t want to log in to an account, go to the bottom of the page. There is a gray area, with the option that says “pay with debit or credit card” on that page. If you chose that option money from your bank will go through paypal to my account, but you don’t have to create a paypal user. After you pay, you also have to fill in the form – confirming you’re in. There just fill in that you payed via credit card where we ask you for your transaction ID, and skip the field for paypal e-mail. What if I signed up and then can’t participate? There is no refund if you can’t participate, but please let me know as soon as you can. If you have signed up and then realize you can’t create all the postcards on time, or you get sick, or something else unexpected happens, please let me know as soon as possible so I can remove you from the list before I send your name out. Otherwise 10 people will be really disappointed about not getting your postcard, and you will get 10 in your inbox that will make you feel bad that you didn’t follow through. If you simply let me know before I send out the addresses, I will remove you from the swap and everyone will be grateful for your honesty. Sometimes life happens, we understand. Also, if you let me know that you can’t participate this time around, you can save your fee and postpone your participate to the next postcard swap I arrange (there is two each year: in spring and fall). It is up to you to send me an e-mail reminding me of your spot when the next swap round opens up. What is included in the fee? I am charging a small fee (8 dollars) for participation in the postcard swap that I host. The fee helps pay for the time it takes to arrange a big swap like this one, with 100-200 people participating each time. 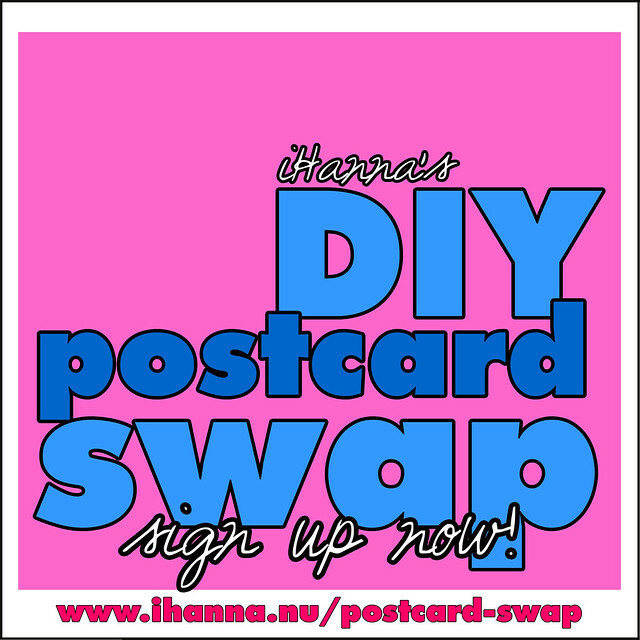 Being part of the swap you’ll also be part of a growing community and you are offered several ways to share your postcard images online. You can read more about what’s included in my post Why you pay to be in the swap. 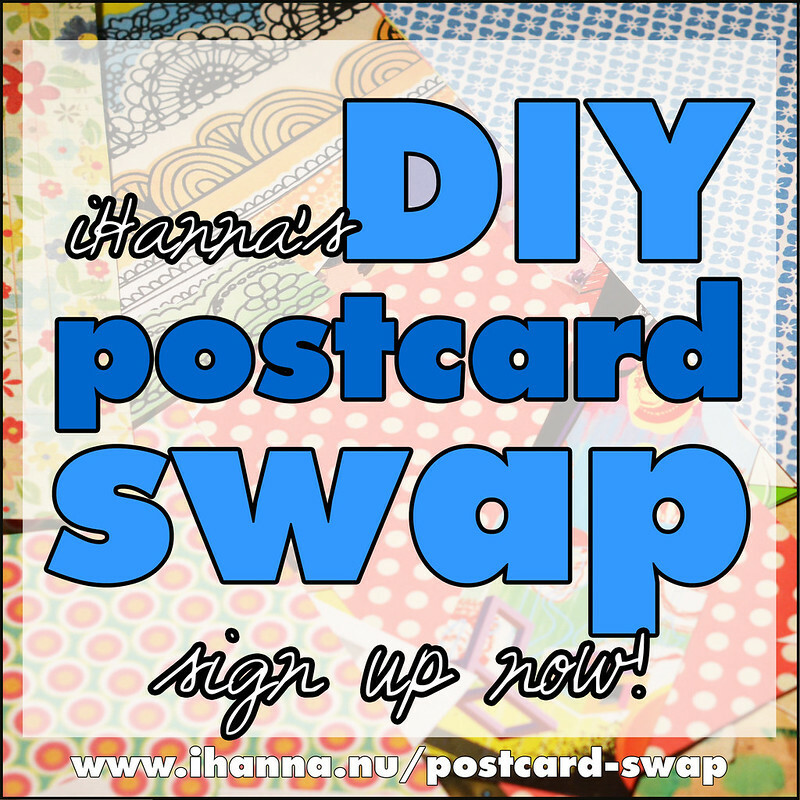 Who can sign up for iHanna’s DIY Postcard Swap? The iHanna DIY Postcard Swap is open to everyone over the age of 18 that wants to have a more creative life. Will I get a confirmation e-mail when I sign up? Signing up is a two-part process. If you paypal you will get a recipet after your payment is done. When you have gotten that, which should just take a few seconds, go back to the sign-up-page and below the payment button there is a form, that you must fill in in order to be registered for the swap! You will get a confirmation of that information to your e-mail, via google documents. Double check that everything is correct, and if you need to change something please Contact iHanna. Do not fill in the form twice, or try to resubmit it with changed information. Thank you. If you’re not using paypal as your method of payment you might not get a receipt, but you will get the form confirmation via Google docs to the e-mail you filled in. Can I put my postcards in an envelope? You can send the postcards in an envelope for protection if you want to, but you do not have to. Personally I prefer to get a postcard send the postcard way – without the envelope! In that way the postman will get to see it too. And also, the whole idea of mail art is to send it through the mail system openly and spread the power of art. If yours is very delicate or has chunky bits that might fall of, maybe it’s not a good fit to use that piece as mail art? Design your postcard so that you can send it like a postcard. If you’re unsure wether it will hold going through the mail system, send a trial postcard to yourself first, to see how it holds up. I agree with artist Lenore Tawney who believed that the cancelling the post office did was part of the design. The book about her work is called Postcard Collages. Do I need to write a message on the back? Yes. You should write a message on the back! Don’t send it blank. I know you don’t know this person you’re addressing, but a blank card feels very impersonal to get. Just say hi and write something about yourself, the weather, your inspiration for the card, your materials, or anything you like. If you are writing something on the front of your postcard, with hand lettering or collage, avoid negative sayings or words. If it’s something that would make you happy and that you would feel empowered by – it will be awesome. Lastly, don’t forget to add the correct amount of postal stamps – and put it in a mail box when you’re done! How “original” does it have to be? All your 10 postcards should be original artwork! Art is about making something new that did not exist before, or transforming it to something that is yours. Original means that you do not send out photocopies, but to duplicate your own style or to repeat a motif that you love, and make similar postcards is totally okay. It’s also fine to make all of them different. You are the artist. Make it fun for you! How can I keep Track of everything in the swap? There is a printable and free DIY Postcard Swap Tracker that you can download and print for this swap. It’s the perfect tool to remember who you sent postcards to, what postcards you’ve photographed and shared online on social media, and who you receive postcards from. You do not have to use the tracker of course, it’s just available if you need it. How can I share this Swap with my friends & family? 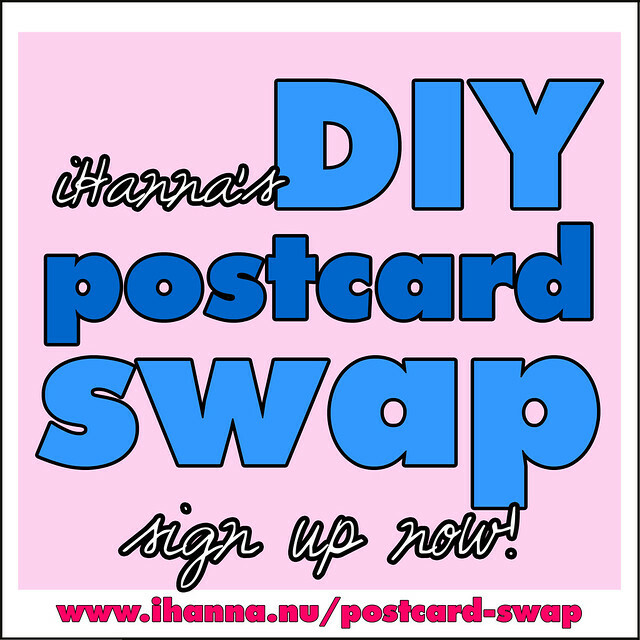 If you have friends that are creative (or that you think should be more creative) you can invite them to be in the DIY Postcard Swap too. Create, connect & share – that’s the swap slogan after all, so the more the merrier of course. Forward The Newsletter to them, if you are subscribed to it, or simply send them a link to the information page, or share it on your Facebook page. Pay their fee and let them know that you’re making postcards together! You are most welcome to link here, share this post on your Facebook page for friends and family to see, via twitter (I’m @iHanna if you want to ping me), pin the swap-button or any image on this page to Pinterest, add it to your instagram feed – or write about the swap in your next blog post or your newsletter. It means a lot to me and this swap reaching those interested to join us! I would love if you use the swap buttons that I designed! Post it anywhere, for example in your blog’s sidebar, your Facebook wall or instagram – I so appreciate that! Click the button above that you like most, save the bigger image to your computer and upload it to where you want to share it. If it’s on your blog link it to this page (http://www.ihanna.nu/postcard-swap/), thanks. If you’re interested in a collaboration, let me know. I need some Inspiration. Can you help? I’ve got plenty of content on this blog about making mixed media postcards, including video tutorials, photo tutorials, visual inspiration and a Pinterest board full of DIY inspiration. All you have to do is take note of what you like and then start experimenting on your own. Here is a good place to start digging for inspiration. Mail Art Postcards by Studio iHanna on YouTube (click the link if you can’t see the video embedded here). After participating a few times, you can look forward to having a wonderful collection of handmade postcards. I’ve got mine in a cute DIY binder. The wait is too long. What can I do in the meantime? Snap a few photos of your own postcards before you sent them out! Then feel free to share them online, so that others can be inspired (and maybe impressed) by your cards. I suggest first sharing a picture of your entire pile, before the swap closes so that your friends could find it and join too. 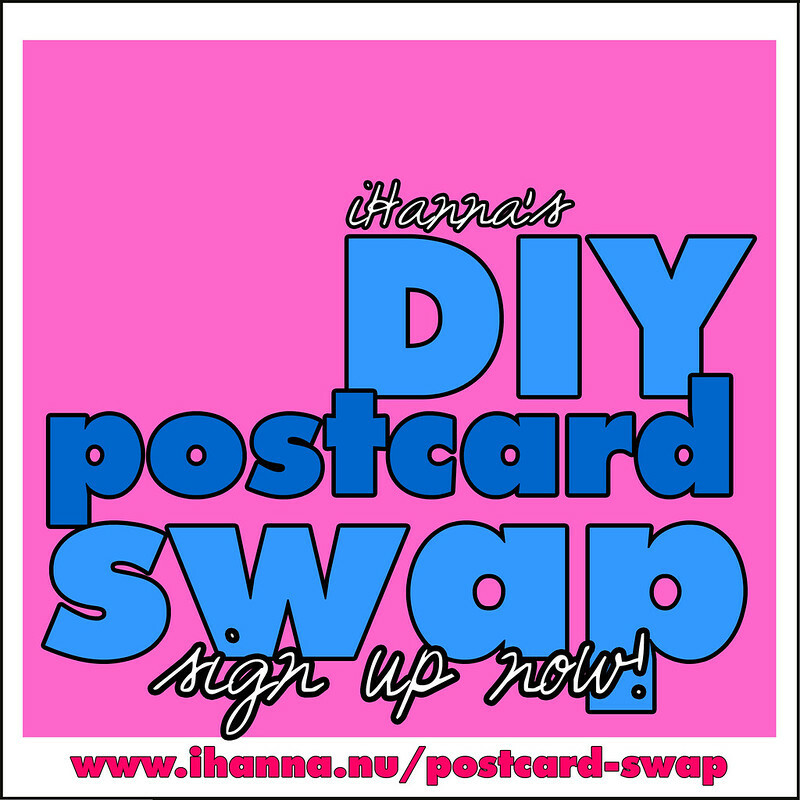 Tag me on instagram @ihannas and use the hashtag #diypostcardswap and other #mailart tags of course. Then you can start sharing your individual postcard photos, one by one on social media. After a while new postcards shows up everywhere, and it’s super fun to see what everyone is doing. Scroll through the hashtag #diypostcardswap on Instagram, and like and comment everything! What materials can I use? All mediums are welcome, but know that most of the postcards in previous swaps have been mixed media in some way. You can draw, doodle, paint, decoupage, collage, sew, stamp or mix it up as you please. I have received paper cut postcards, and postcards with zentangles, paper patchwork, machine embroidered (on paper), illustrations, wool embroidery postcards, and even a postcard painted on canvas. Imagination is the only limit, and we’ve got plenty of ideas to share with you! I have even seen a knitted postcards in this swap! You will get a gold star if you can incorporate recycled material in some way, because that is good for the environment. What should I do with the backside? A Postcard backside consists of two areas, one for a greeting or personal message and one for the address and stamp of the receiver. You can draw these lines and areas yourself, or use my free printable backside and glue it to the back of your artwork. I think you should always add in a Greeting. And don’t forget to add the right amount of Postal Stamps. Some people participate in other swaps and exchanges, and they greatly appreciate if you stat what swap this is from: the iHanna DIY Postcard Swap + year. What Size should my Postcards be? I’m not dictating the size of your postcards. I suggest copying the size of a regular postcard to make a template that you can use when creating yours. There is a standard size for postcards in some countries – but there are no rules about size in this swap. You are free to create whatever you want! Can I share the postcards I receive on Facebook? I’ve been asked to create a postcard group on Facebook but declined. I do not need another thing to keep track of in my life. Share your postcards in the mixed media and mail art groups you’re already in, or on your own Facebook wall. If your profile is open I will be notified and see your cards if you write something like: “A postcard made for the DIY Postcard Swap of Studio iHanna” where Facebook will link Studio iHanna to my FB-page. This does currently only work if you have liked my FB-page and are on the Facebook site from a regular computer, not an phone or ipad app! Also tag your post #diypostcardswap as tags work on Facebook too and are rather useful. Can I share the postcards I receive Online? Yes you can share the postcards you get. In fact, I think it’s great if you do. The swap is about inspiring each other and if you share what you get you’ll inspire even more people. Each creator has the copyright, but as long you’re purpose is not commercial it is okay to share them on instagram (hashtagged #diypostcardswap), in the link up post on my blog, on your own blog or in the Flickr Group! Please do not share someone else’s e-mail or their postal address, in writing or as a photo of the back of the postcard, though. Some people will not feel comfortable having these things floating around online. All links/resources can be found on the main swap information page. I only got very few postcards – what should I do? Wait a bit longer please. Remember that things can happen. People get sick, or forget to check their e-mail. International mail can take several weeks to get to you. There is no guarantee that you will receive 10 postcards, I can not travel around the world and make people follow through on a swap they signed up on! But if you get less than maybe eight postcards, let me know via e-mail. Tell me from who you have gotten postcards, and I will contact the non-senders and ask what happened on their end. There is no e-mail address on the back! Can you help me? No, sorry but I can not. If the person sending didn’t add their e-mail to the back of their card I will assume they choose not to do that. Maybe they’re not comfortable sharing it. So I will not give out their e-mail to you. Send them a silent thank you in your head, that will be enough. One of the things I love about sending real art through the mail system is to get away from e-mail for a while, so I don’t think anyone needs to e-mail their gratitude at all. But it’s up to you, and if you get an e-mail address on your postcards, it’s up to you if you want to contact the sender or not. Where are my 10 addresses? I did sign up, but never heard from you. Where are my 10 addresses? This is an e-mail/service provider problem I am encountering over and over again. I can assure you that if you paid and added your address into the form, and it is now after the date I state I’ll contact you, I have contacted you. I promise! I see it in my own “sent folder”. SO what to do? First, check your SPAM folder. Then check your other e-mail account, if you have one. Maybe that’s the one you gave me? If you can not find it, let me know via the contact form on my page but state another e-mail address. If you can’t see my first e-mail, which is sent from this domain, then you probably won’t get my reply to you are requesting. I’ll e-mail the list to your work, to your spouse, to a friend – I really want you to get it in time, and I re-send lists all the time because of this problem. You can also contact me through my Facebook page, if all else fails. Do you have a question that is not answered on this page, feel free to contact me!